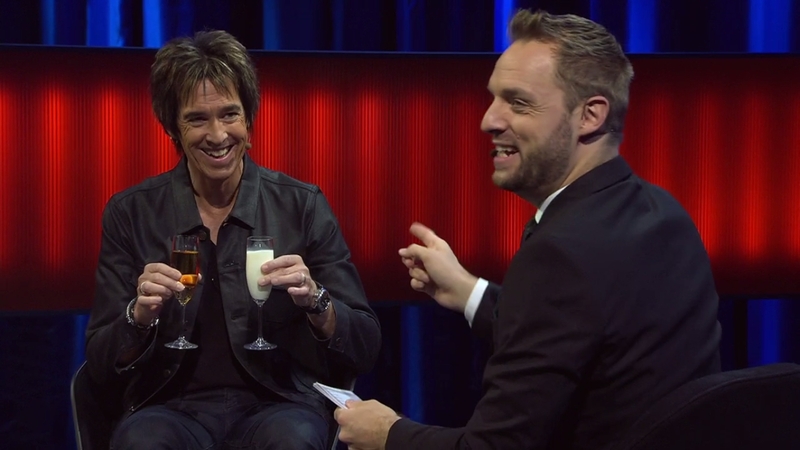 A week ago it turned out that Per Gessle would be a guest on Swedish talk show “Robins” on September 30 on SVT1. We all got excited to see an interview with Mr. G on such a program. It’s similar to the late night shows you can see on US channels and stand-up comedian Robin Paulsson, the host is often called the Swedish David Letterman. The recordings happened on 28th September and since then we could see many pictures where Per, Robin and the other guest on the show, Keyyo appeared. We couldn’t wait anymore for tonite when a teaser video was published yesterday, with Keyyo getting pranked. Seemed to be a fun TV program and we could already see in that teaser that Mr. G had a good time during the show. Finally, tonight we could watch the real deal, the complete program with the Per Gessle interview in it. The show starts with Robin telling Per backstage that the lyrics to The Look is a bit confusing. Keyyo starts reading it, then Robin continues. Per says he finds nothing strange in it, but Robin says they don’t understand the text. Then Per says it’s in English. Robin and Keyyo say: aaaah, English, then they can understand the rest too, na-na-na-na-na-na… Haha. Per enters the studio at around 5 minutes in and gets a huge applause and loud woohoo from the audience. First Robin and Per are talking about the differences between their jobs. Robin says he envies Per, because he can play his songs from the ’80s and people love them, but no one wants to hear a comedian telling a joke from 1981. Per says it might not be true. He saw Monty Python on their farewell tour in London and was wondering if it could be fun to hear a joke what he already heard so many times, the ”Parrot Sketch” and it was much fun even if he knew exactly when the fun part came and what the joke was about. Everyone loved it. Robin says he as a comedian can get tired of certain jokes and throws them away. He asks Per what happens if he is doing a concert and skips Sommartider. Mr. G says it’s good to have some more songs. As a last comparison of their jobs, Robin tells Per he can fill in The Look with nanananana and everyone loves it, but he can’t come up with nanananana in his jokes, people would miss something. Per says nanananana is good, because it’s international. The guys are talking about Per’s new album. Per tells he recorded 2 albums in Nashville, En vacker natt and En vacker dag. Robin mentions it’s said to be Per’s most personal release ever. Robin asks Mr. G how he means it’s the most personal and Per tells about the tough times in his family, that his mother, brother and sister passed away during the past 3 years and it affected the atmosphere of his music. Robin asks Per whether it is more difficult to write a personal song or a summer song like Sommartider. Per says one of the questions he gets most often is how to write a hit. He has no clue. He never plans to write a hit, he just can’t plan it. Robin is surprised that it means that Per never knows which song would become a hit. Then Per tells him he is the worst at choosing singles. He wanted to leave “Här kommer alla känslorna” off Mazarin. Robin concludes Per is a very good musician, but at the same time also very bad. Robin says it feels like Per is a normal person despite him being a pop star, very down-to-earth. He asks Per if success has ever gone to his head. Mr. G says he doesn’t know, it’s hard to tell, because he was 19-20 when Gyllene Tider broke through, so he lived all his life in this “celebrity fame”. So he doesn’t know how life is without all this. Maybe he would be unbearable. Robin says he is not unbearable, they met backstage. OK, he had to pay for an autograph, but that’s OK. Haha. To see how the pop star life touched Per, Robin asks questions and Mr. G has to answer whether it’s typically an everyday thing or a typically luxury thing. If he replies everyday, he has to drink milk, if he replies luxury, he has to drink champagne. Per asks what kind of champagne it is. Haha. Robin says Per is such a gourmet. Ready, steady, go! Robin’s first question: Ferrari or bus? Per takes a sip from the champagne. Next question: Russian caviar or Kalles caviar? Per chooses Kalles and takes a sip from the milk. Next: patent shoes or clogs? Per takes a sip from the champagne. Robin asks if Per has clogs. Mr. G says no, he drinks. Next: Venice Beach or Tylösand? Here Per asks which one is which. Haha. Good question. He chooses the champagne and says Tylösand. Next: watching a Real Madrid or a Halmia match? Per chooses Halmia and drinks champagne. Robin concludes Per is a big fan, but also mentions that it doesn’t go so good for Halmia now as for Halmstad. Per says: soon! Haha. Last question: sitting on a throne in a palace or on a rock by a lake in a forest (på en sten vid en sjö i en skog)? It’s the rock! And Mr. G takes a sip from the champagne and says it’s a good one, the champagne. Robin says let’s turn back time to the ‘70s. How was it being Sweden’s biggest pop star at the age of 20? Per says it was bewildering. Gyllene Tider did 6 concerts before they became No. 1. They came from nowhere. Robin says 6 gigs are nothing, one can’t become confident on stage after only 6 shows. Per says they weren’t too confident at their seventh gig either. Haha. Robin asks which song was No. 1 then. Per says Flickorna på TV2. Robin says it must have changed Per’s life. Mr. G says totally, it was cool. Suddenly he got 2000 cards on his birthday, people stole his laundry that hung in the garden to dry, everything movable disappeared, e.g. the number plate on the car. Robin asks Per what the key to success is. Per says the 3T: tur, tajming, talang, i.e. luck, timing and talent. Robin adds hard work maybe. Per says yeah, one has to do his own 10000 hours, but there are a lot of coincidences and you also have to be in the right place at the right time. Robin says it’s easy to believe that Per’s career has always been going upwards, but there was a period between Gyllene Tider and Roxette, around 1985 when it was a tough time. He asks Per if he could describe that period. Per first says no and laughs. Then he tells Gyllene Tider was over in 1984 and he didn’t have a record contract or a vision what he should do. He started writing songs for others, because he had the reputation as a songwriter. He says the coolest was that he knew Marie Fredriksson since years then as they shared a rehearsal room in the ’70s and they were talking about doing something together. Per wrote a song to Pernilla Wahlgren, Svarta glas, but she has never recorded it. Then Per translated it into English and that became Roxette’s first single, Neverending Love, which was a big hit in Sweden in 1986. They recorded an album from all his refused Swedish songs. Per translated the songs into English and that became Roxette’s first album. Robin says when he was a child he thought Per and Marie were a couple. Per says many thought so and many others thought he was Marie’s manager and Marie was called Roxette. A TV studio had a dressing room for Marie and they showed the green room for Per. Robin mentions that It Must Have Been Love was played 4 million times already until 2005 on the radio in the US. It’s like playing it non stop for 35 years. Per says he can talk about this song for long. It was written in 1987. They tried to get on the market in Germany and they were said that it’s easier with a Christmas song. So he wrote “It Must Have Been Love (Christmas for The Broken Hearted)”. When they played it for the German, they hated it. So they released it in Sweden and it became a Christmas hit in 1987. Robin says one doesn’t think about this song as a Christmas song. Then Per tells the story how it became a song for the movie Pretty Woman some years later. Robin concludes Per recycles a lot. Everyone laughs. Robin asks Per if he has ever felt it’s enough now. Per says he is not done yet. Nowadays he feels more confident about what he is doing than 20 years ago, because back then he wanted to prove things for himself. Now everything is more relaxed and he is doing things for his own sake. It’s more fun now. It was fun before too, of course, but now it’s devilishly fun. With this the interview ends, but Per stays in the studio while Robin’s other guest, Keyyo arrives. She is a 20-year-old YouTuber who is very popular in Sweden. She is originally from Russia, but lives in Sweden since she was 8. Robin asks Keyyo if she listened to Per, his music. Keyyo says she has to be honest, she didn’t listen to Per, but her mother did and now her mother envies Keyyo a lot for being on the same show as Per Gessle. Keyyo tells a story that when she was 8-9 years old and they were driving in the car and Tycker om när du tar på mej came on the radio and exactly this part: ”Jag tycker om dina bröst i morgonljuset”, she always thought it was so filthy. Haha. She also compliments Per saying he is so normal. Everyone laughs. Then the show is about Keyyo who also got pranked and you can see Per had a good time also in the second half of the show. It was a nice program. Would be fun to see Mr. G more on TV shows like this. Cool thing! Watch the TV show HERE!